I wanted to update these shoes that were collecting dust in the back of my closet so I painted the wooden heel and rim of the sole. I love the color blocking trend that's so big right now and this didn't cost me a dime! Wow, great work, i would never have thought of doing that! You just rocked my word! Can I post about this on my blog? Wow!, very nice, look great!. This is such a great idea! Can I ask what kind of paint you used to get such a smooth finish? Oh wow they turned out great! I actually used acrylic and a couple coats of it! I know it's water based but I won't be getting these wet. Honestly, if I even wear them once it will be worth it! your rock! these look super fab! color block. amazing. best diy i've seen in a long time jenn! amazing! 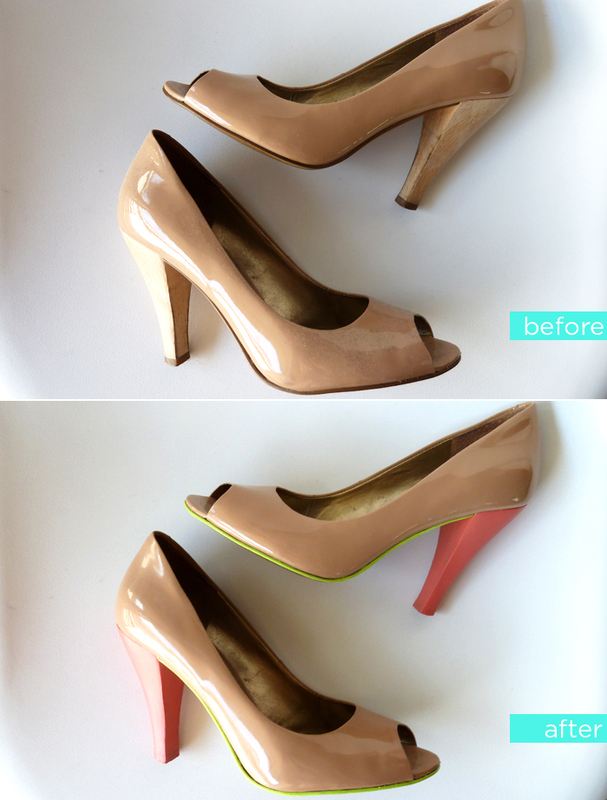 the simplest way to update your shoes! genius!!! totally transformed the shoes. that is pretty awesome! love the colours you chose! Cannot believe you DIY'd these...they are beautiful! Oh my word - those are DARLING! Haha, genius idea with a wonderful and stylish result! BTW: the earrings arrived 2 days ago and I am super happy with them... especially the extra pair. Very very sweet of you. Thank you so much. More on my blog soon. Wow! Very good, they were a luxury. I'm link it! You are such a genius! :) Love the idea and the new look. SOOOO cool. I've used nail polish to fix up a pair of shoes whose color I wasn't quite happy with before, and it's held up very nicely. Plus, super fast & easy to re-apply if necessary! omg! That is amazing! I've seen shoes like that in all the stores but who'd a thunk you could do it yourself! So Cool!! what a great idea!! WOW! You did an amazing job. Looks like it came from the store!